Rock Art in Russian Far East and in Siberia. A bird’s eye view over a continent. There are about half a million of petroglyphs known in Siberia and the Far East of Russia. Nobody knows up to now how many are still to be discovered. At any rate these documents of history deserve to be studied and added to the hoard of world culture. They are original sources for the history of the different peoples in Central and North-eastern Asia before the beginning of written texts there. These sources of history are difficult to read as the other rock art, too. A bird’s eye view is given about the main groups of rock art in Siberia and Russian Far East with an introductory bibliography. They are dated post diluvial, a big group into the 2nd and 1st millennia BC. Only a part is painted, while the majority is scratched or picked. The vast region from the Pacific to the Urals with its about 10000 km length houses a great number of sites with rock art. They form a lot of local groups and date from the Palaeolithic up to our time. There are known single sites with more than 100000 drawings, so that here only a bird’s eye view could be given. I devote this paper to the memory of Alexey Okladnikov, one of the pioneers of the investigations in Siberian rock art who had worked in many fields from the Amur to the Tom, so I can base my report in main on his publications. He was an enthusiast of his job, and when a typical Soviet reception was given on occasion of his 75th birthday in his institute, he sent a cable “congratulation – I stay in the excavation” – the single case I know about. 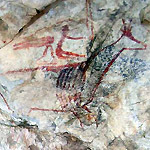 The rock art in Siberia is rather uniform in the two main areas of life – the forest region in the north and the wooded steppe in the south. A special role played always the Altai, the connection between the western and the eastern steppes. The forest region along the Amur seems to have been a conservative zone keeping its art through the millennia. In the northern area the population chose the elk as the main motif to express their feelings, while the western zone was dominated in the 2nd millennium BC by the two-wheeled carriage and in the 1st millennium BC by the Sakian “animal style”. 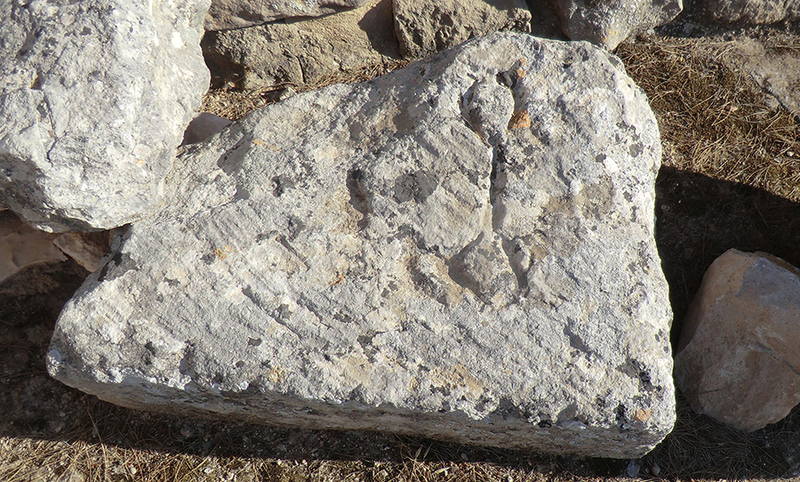 Later petroglyphs reflect the nomadic life of the Huns and the Turco-Mongol people. The tribes settling along the Amur pronounced the human-like mask and a “skeleton” style – both reflecting a type of Shamanism. Masks are common in the forest area, too, and the elk may express some myths about the world according to fairy-tales in nowadays Siberia. The Sakian animal style gave many ideas in form of animals, but we cannot read them in details, though some connections are to be understood by Old Iranian believes. The material presented here is far from being complete – it will give only an idea about the art on the rocks in Northern and Central Asia. 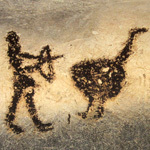 The rock art is one of the main sources for the history of the tribes living in the wooded area at both sides of the Lower Amur. Several motives seem to indicate that the population did not change during the last millennia. The rock art was surveyed at the rivers Ussuri, Amur, and Suyfun. 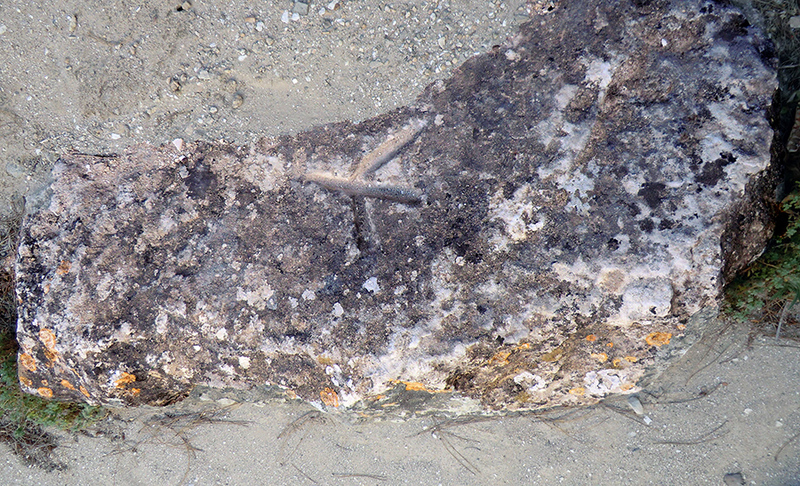 A big group of 19 decorated stones was found at the right bank of the Amur at Sakachi-Alyan. The dominating motif is the “mask”, similar to human sculls (1) drawn in broad lines with big eyes, sometimes besides boats (2) and heavy animals (3) without horns – they represent bears. Other pictures show elks (4) (?) , cows (5), and riders on horseback (6). Some “masks” have a sort of body (7) in a “skeletal style” like various elks (8). A relatively well drawn bear is an exception (9). The same a man fleeing a bear (10). Volutes like on folk art textiles (11) are strange. Riders in an abstract style (12) seem to be intrusive. Swans repeat such figures in Altai art (13). 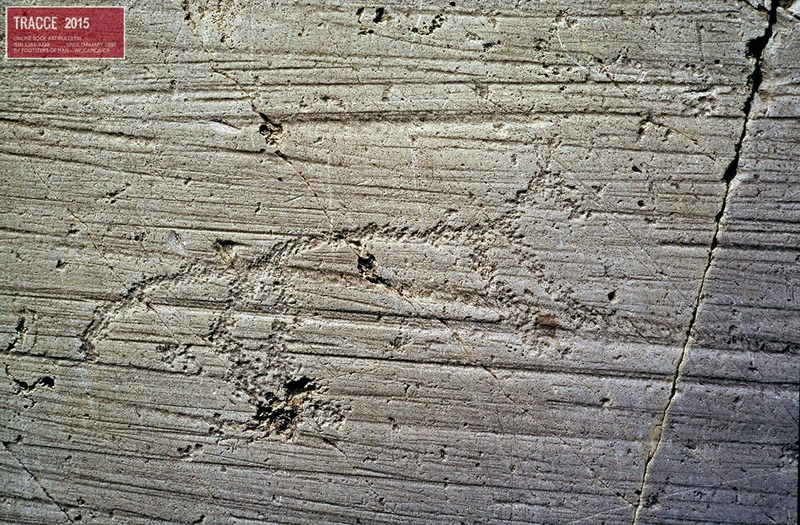 Later drawings show riders, birds, and quadrupeds (14) found at Moj. The river system of the Lena contains several groups of rock art, with local and historical differences. The oldest parts are believed to have been made in the Late Palaeolithic Age, while the majority is Turko-Mongolian art. At the Upper Lena the eldest ones were found at Kozlova (1) and Vorob’evo (2). They show mainly female and male elks, some of them completely picked, others only contoured. 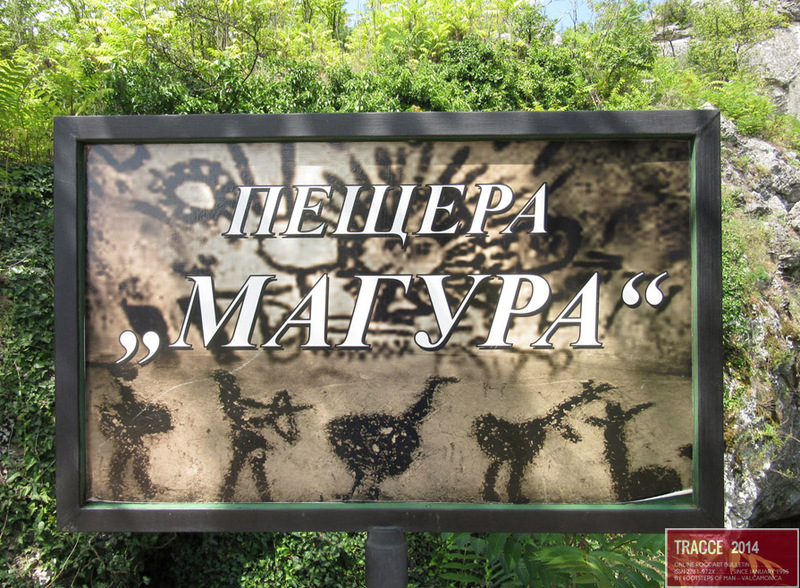 Similar paintings of the Turkish period were discovered at Bolshaya Pad’, at the ShamanKamen’ and at Podkamen’. In Kulenga (6) there are drawings with orthodox cross together with armed riders, in one case in a fight. Seldom are rows of dancers as at Kozlovo (7). Some late may be Russian – drawings show houses, boats and animals (8). Undatable anthropomorphic figures with raised arms and a head ending in three points were found at Kozlovo (9) and at Tal’man (10) They might be pre-Turkish and appear in Western Siberian art, too, while “masks” are seldom(11). 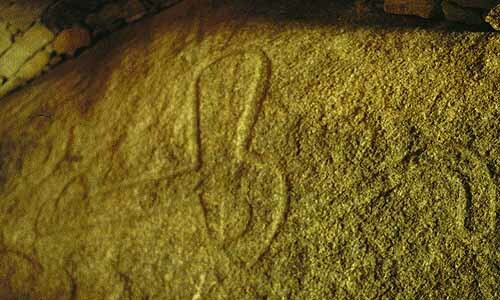 The existence of rock art near the lake Baikal is known since more than hundred years. The main sites are the Sayan-Zaba Bay, the Aya Bay, and the influence of the Angara into the lake. Okladnikov believed that two elk pictures at the Sakhyurte mountain had been made in the Stone Age, for they were found aside a working place for making stone tools. Okladnikov dated most of the drawings into the 2nd millennium BC and the latest one with reservation into the Early Turkish period. Here the main motif is the “devil” with two horns representing according to his opinion Shamans (1). Often water fowls – may be swans – were depicted (2). In the Bukhta Aya (3) there appear two men of “skeleton” type – Shamans as some stags are shown in this manner similar to animal style (4). Riders and hunters are seldom. The surveyed area is the valley of the river Uda and its tributaries Ona, Sala, Onona, and Inogda. Rich in rock art are the cliffs of the mountain Khotogoy-Khabsagay, and the rocks of Titovskoy Sopka near Chita. The dominant motives are here birds of prey. Okladnikov tried to identify them as eagle, falcon, hawk, and kite. They are shown either together or single on nearby all cliffs. It looks like that religious ideas are connected with them. Most pictures show birds and men and figures between them probably indicating a sort of flying up of the soul (?). Typical is the sketch at the Khotogoy-Khabsagay (1) , where human figures stand in a geometrical form filled with points; a row of birds are rising. Such structures – cemeteries ? – were repeated several times, for instance at Khachurt (2). The figures are rough and do not show details. The flying bird is depicted on bronze knives of the eastern animal style, possibly dating these pictures to the 1st millennium BC. The valley of the Angara and its tributaries have mainly red paintings and scratchings. 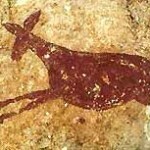 The paintings may be connected with the similar groups in Mongolia and Buryatia. The colour is ochre. 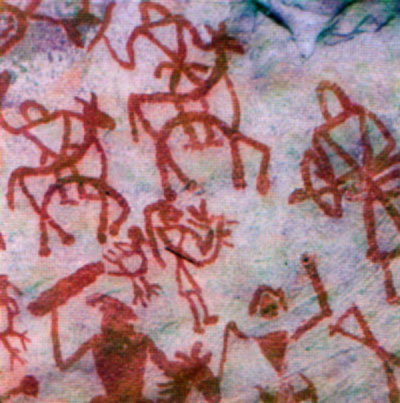 The rock art at the Angara was studied by several scholars, but now most of them are submerged under the water of the artificial lake at Bratsk. Okladnikov had described twenty four sites in 1966. 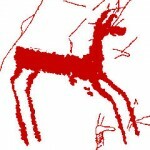 The dominant motif is the marching elk (1). Sometimes a fish (2) is shown. Other pictures represent the Baikal seal (3) , so at Kamennyy Ostrov 2. There are a lot of human beings and “devils” like figures with “horns” and tail (4). The men driving in boats are fishers (5). Late scratched pictures of riders on horseback might be Turko-Mongolian (6), the others are not datable. Several “masks” remind the Amur art (7). A common motif is a man on ski, sometimes as elk hunters (8). Rows of “dancing” figures appear at Kamennyy Ostrov (9). 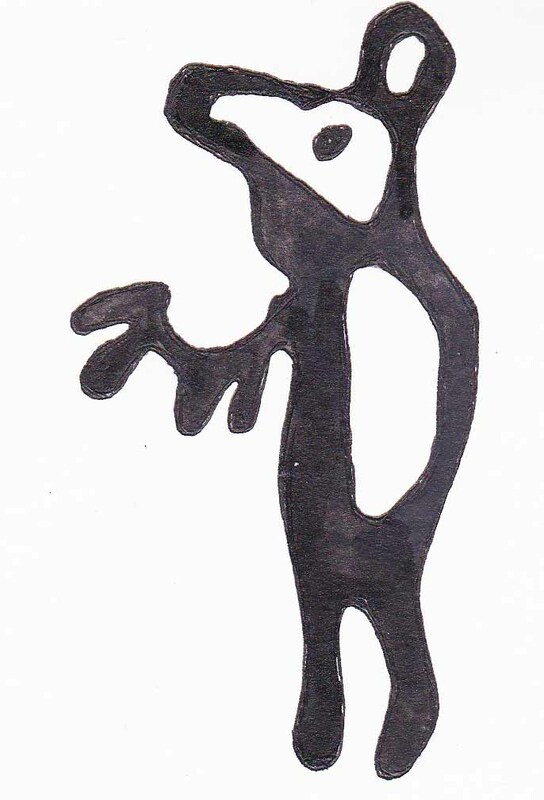 Some scratchings are Shamans drawn in “skeleton” style (10). There are to be seen also many very conventional boats. So the rock art of the Angara could be ascribed in part to the tribes of the forest and in part to Turkish intruders. The religious base was the Shamanism. The mountains of Mongolia are filled by pictures from many millennia – from Palaeolithic till the Turko-Mongolian period. Most of the sites are atypical with single animals or groups of them, in main stag, goat, and sheep (1). Some of them remind the Sakian animal style as in Alarin-Gol (2). The cave Khoyt Cenker Aguli (3) deserves new survey for its importance. The red paintings may be the oldest ones in Central Asia. Besides cattle and horse (4) appear crane (5), mammoth (6), and antelopes. Volkov and Novgorodova (7) visited the cave again in 1969 and underlined the early date. Like Okladnikov both took the cranes as ostriches. 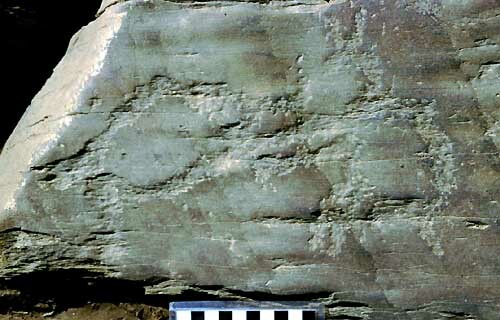 They discovered petroglyphs (8) of a very stylised form below a neolithic level at Arshan Khad and mentioned different other sites with similar early glyphs. Both dated the pictures from the mount Chandoman’ into Neolithic and Chalcolithic times. Cattle, horses, and sheep are picked out partly in silhouettes. Besides these animals there are shown some snakes and birds. The mountains of the Altai ridge were an important part of the nomadic area at least since the late 4th millenium BC. They served as a refugium in winter time, when the icy storms and the snow made the survival on the steppes in the north problematical. They were pass ways from southern Siberia to Mongolia and vice versa. Their valleys were harbours in winter and refugial resorts for surviving for parts of tribes butchered during tribal warfare. The valleys served as burial places for many fold folk and the circumstances – frozen soil, aridity and others – preserved a lot of important materials. But since the end of the nomadic empires the Altai was a lonely area between China and Russia and the mountains fell back in obscureness. Besides many cemeteries and Kurgans several areas were surveyed for rock art and again thousands of drawings were recorded. The problem of dating is open as usual, but several groups could be roughly identified by the motives and the style. Dominant are hunting scenes and single animals. Aside the river Elangash picked pictures were discovered besides some scratched ones. They show wild sheep, stags, yaks, dogs, horses, camels, birds, and human beings, mostly hunters or travellers. The hunters are represented shooting with bows and arrows, some by foot (1), others on a two-wheeled carriage (2), or on horsebacks (3). The walking hunters cannot be dated, while carriages might be referred to the 2nd and early 1st millennia BC. Cars are represented with the wheels seen from the side, the animals with the backsides towards the yoke and the driver in the same level as the car. Unusual are the pictures of caravans with loaden yaks (4), single yaks with packs on the back or with a camel (5). An exception is the rider with a banner (6), probably a Turkish picture. Some of the stags are drawn in the typical Sakian animal style (7), but the majority must be left undated. Two riders with their horses in “flying gallop” (8) could be of Hunnic period or later. Fighting men are rarely depicted (9). 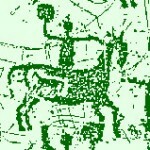 Most pictures are picked with the complete silhouette, but some horses are depicted only with the contour. They might be the oldest ones here (10). From a subsequent period we can find scratches with hunting scenes, riders, yurts, herding scenes (11) with camels and yaks (12), women (13) or fightings between men (14). Here were found principally pictures of stags, sheep, and goats, some of them show hunters as at Kuyas (1). The style is not very remarkably. Where the Yenisei pass the Sajan Canyon a lot of rock art sites were found (1) between them Ortaa-Sargol, the “way of Chingiz Khan” and Mugur-Sargol. The Bronze Age is represented by the usual hunting carriages (2) and wild animals, goats, sheep, cattle, stags, strange warriors or hunters with a hat – or helmet -, bows, and a bag (3). The Early Iron Age is represented at the “way of Chingiz Khan” with stags in Scythian style (4). A fine boar in animal style was found at Ortaa-Sargol (5) together with Scythian stags (6). Hunnic-Sarmatian drawings show riding hunters and goats, stags and horses (7). 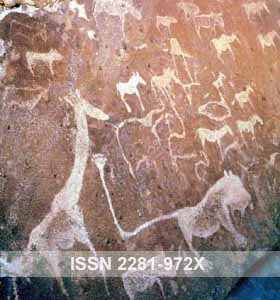 Later petroglyphs show animals, between them caravans with camels (8). The valley of the “Big river”, Ulug-Khema, in Tuva is a rich rock art area with several sites. The most impressive pictures represent more than seventy masks wearing horns, so appearing with a kind of demonic outfit (1). Devlet compared them with the famous stelae of the “Okunev” culture, better to say Tasmin culture, and the pictures from the Amur. They appear in groups and isolated. A strange one at Mugur-Sargol presents plans of houses with gardens or fields like in Val Camonica (2). Some drawings with racing carriages may be dated into the Bronze Age, like the ones near the river Chinge (3) and at Mugur-Sargol (4). Another group is formed by animals in the Sakian animal style at Bizhiktig Khaya (5), Mozola-Khomuzadyg (6) and Malyy-Kol (7). Hunting scenes, riders, and men with yaks as carriers appear and might pertain to a later period. Three sites were republished in 1994 as Oglakhty I-III (1) in Khakasia. 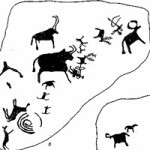 There are several pictures of cattle believed to be of Palaeolithic Age (2). 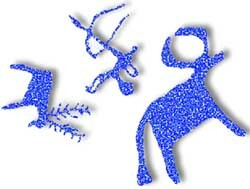 The majority of the scratchings are from the 1st millennium BC, and some are typical of the Siberian animal style, as the man holding the reins of two horses (3) at Oglakhty I or the sitting goat at the same site. 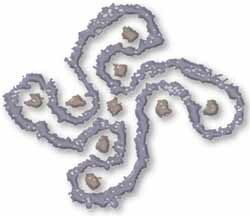 Other animals were picked completely or represented with atypical contours. They remind the “skeleton” style from the Far East. The rock art of the river Tom was known since the 17th century, but in the fifties of this century there were published new sites. Okladnikov tried to differentiate drawings from the 4th to the 1st millennia BC. The main motif is again the elk in several postures showing that this animal (1) had been of central importance in the whole forest area in Northern Asia. The human figures seem to be connected with the pictures of the elks. A part of the elks are shown as dying hit by javelins and arrows (2) and others seem to be tamed. Besides the elk also owls (3), bears (4), herons, and other beasts are represented. Some stylised masks (5) and boats recall the eastern rock art. The most prominent site in the Ferghana valley is Saimaly-Tash with more than 100000 glyphs. They include ploughing scenes, wild and domesticated animals (1), and hunting chariots. 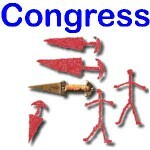 They are dated from the Bronze Age to the end of the 1st millennium BC (2). At Aravan two fine horses were found. In Airymach-Tau near Osh similar pictures of horses from the 1st millennium BC were found. The big area of Kazakhstan has in its eastern and southern parts long ranges of mountains showing many petroglyphs. 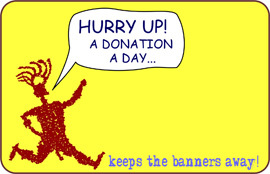 Hundreds of sites has been already published. 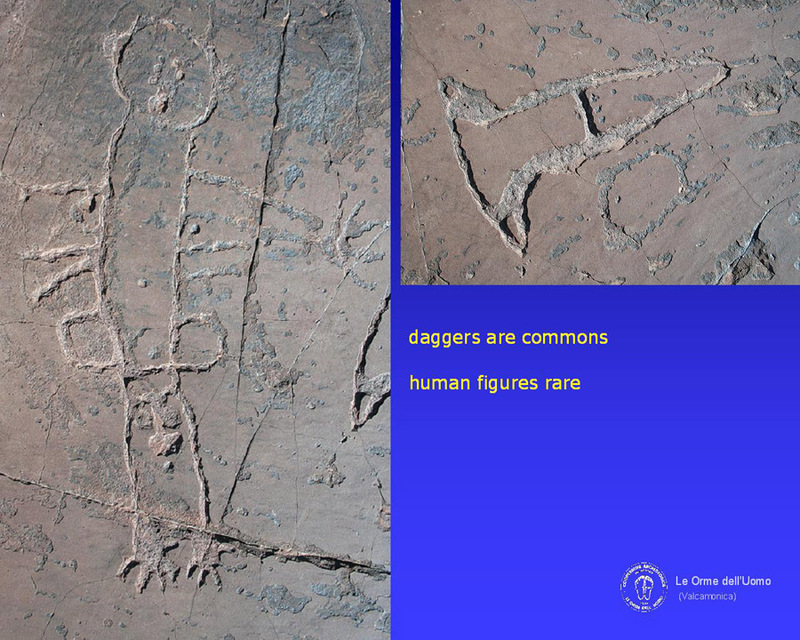 The drawings are relatively uniform and date to the 2nd and the 1st millennia BC. Besides them an unknown number of scratchings from a later time were found, in the region between the river Irtysh and the lake Balkhash down to the Syr Darya and in the area north-east of the lake Aral. One region should be referred, too, as an example – the Karatau ridge in Southern Kasakhstan (1). 2300 slabs with about 6100 scenes or motives were discovered. The oldest group are the carriages used for hunting and war. We have 49 cars depictions from several sites, between them Koybagar II (2). The publishers believe that the cattle on the glyphs represent wild beasts, because they were part of hunting scenes (3). The hunters shoot on goats, birds, and men (4) as at Koybagar II. The camels are frequently shown domesticated like the numerous dogs (5) in Arpauzen III. In the Semireche a man (?) with a sun as head appears in several sites as at Tamgaly (6). These pictures are explained as a Mithras-like god (7). Pictures believed to have been made in the 1st millennium BC are less important, while dancing groups are difficult to be dated. 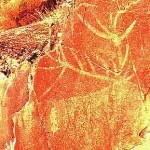 The later rock art continued to the 20th century AD. Buddhist images with inscriptions were found in the Kapchagay ravine and are thought to be made in the 2nd century AD(8)– a doubtful date. Okladnikov, Lena, 1977, Plate 29,31-49, 54 a.o. Okladnikov, Lena, 1977, Plate 49-50, 56, 58,65 a.o. Okladnikov, Lena, 1977, Plate 43,81-84 a.o. Okladnikov, Lena, 1977, Plate 155,189 a.o. Okladnikov, Angary, 1966, Plate 1,3,4?,8,9,16,95,105,109,156 a.o. Okladnikov, Chulatyn Gola, 198 1, Plate 27 a. o.
Okladnikov a. o., Elangash, 1979, Plate 3 0, 72, 74, 1; 88 a. o.
Devlet, M.A. : Petroglify Ulug-Khema. Moscow 1976, fig. 4-7, 10-20, 68 a. o.
Okladnikov, Martynov, Sokrovishcha, 1972, Plate 8,32,33 a.o. 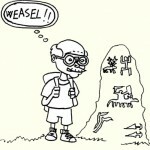 I am currently researching a cultural history of the polar bear (for the University of Washington Press) and was wondering if someone knows of any Siberian rock art images that could be polar bears (other than the Pegtymel petroglyphs). Please contact me if yes. Asplund, H., 2005. The bear and the female: bear-toothpendants in late Iron Age Finland.Suomalaisen Tie-deakatemian Toimituksia. Sarja Humaniora 336, 13–30. Bäckman, L., 1975. Sájva: Föreställningar om Hjälp — och Skydds-väsen i Heliga Fjäll Bland Samerna. (Stockholm Studiesin Comparative Religion 13. ) Stockholm: Almqvist& Wiksell. Bäckman, L., 1983. Förfäderskult: en studie i samernas för-hållande til sine avlidna, in LASTA SáDS Áigecála, ed. E. Helander. Umeå: Samiska Forskarsamfundet, 11–48. Bäckman, L., 2000. Björnen i samisk tradition, in SamiskEtnobiologi: Människor, Djur och Väster i Norr, eds. I. Svanberg & H. Túnonen. Falun: Nya Doxa, 216–26. Bäckman, L. & Å.Hultkrantz (eds. ), 1978. Studies in LappShamanism. Stockholm: Almqvist & Wiksell. Bäckman, L. & Å.Hultkrantz (eds. ), 1985. Saami Pre-ChristianReligion: Studies on the Oldest Traces of Religion Amongthe Saamis. Stockholm: Almqvist & Wiksell Interna-tional. Bakka, E., 1988. Helleristningane på Hammer i Beitstad, Steinkjer, Nord-Trøndelag: Granskingar i 1977 og 1981. Trondheim: Universitetet iTrondheim, Vitenskapsmuseet. Balzer, M. M., 1996. Sacred genders in Siberia: shamans, bearfestivals, and androgyny, in Gender Reversals and Gen-der Cultures: Anthropological and Historical Perspectives, ed. S. P. Ramet. London: Routledge, 164–82. Baudou, E., 1977. Den förhistoriska fångstkulturen i Väster-norrland, in Västernorrlands Förhistoria, eds. E. Bandou& K.— G. Selinge. Härnösand: Västernorrlands länsLandsting, 15–152. 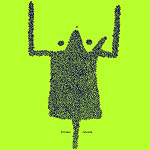 Baudou, E., 1995. Norrlands Forntid: ett Historiskt Perspektiv. (Acta Regiae Societatis Skytteanae. ) Bjästa: CEWE-förlaget. Bieder, R. E., 2005.Bear. (Animal. ) London: Reaktion Books. Bjerck, H. B., 2009.Colonizing seascapes: comparative per-spectives on the development of maritime relationsin the Pleistocene/Holocene transition in north-westEurope, in Mesolithic Horizons, eds. S. McCartan, R. Schulting, G. Warren & P. Woodman. Oxford: OxbowBooks, 16–23. Black, L. T., 1998.Bear in human imagination and in ritual. Ursus 10, 343–7. Blankholm, H. P., 2008. Målsnes 1: an Early Post-glacial CoastalSite in Northern Norway. Oxford: Oxbow Books. Bogoras, W., 1975. The Chukchee. New York (NY): AMS Press. Broadbent, N. D., 2010. Lapps and Labyrinths: Saami Prehistory, Colonization and Cultural Resilience. Washington (DC): Smithsonian Institution Scholarly Press. Carpelan, C., 1975. Älg och björnhuvudföremål från Europasnordliga delar [Elk — and bear-headed objects fromnorthern Europe]. Finskt Museum 82, 5–67. Coleman, E. B., 2005. Aboriginal Art, Identity and Appropriation. (Anthropology and Cultural History in Asia and theIndo-Pacific. ) Aldershot: Ashgate Publishing. Edsman, C.— M., 1994. Jägaren och Makterna: Samiska ochFinska Björnceremonier. Uppsala: Dialekt och folkmin-nesarkivet. Fjellström, P., 1981 (1755). Kort berättelse om lapparnasbjörna-fänge. Norrländska Skrifter 5, 1–34. Friis, J. A., 1871. Lappisk Mythologi: Eventyr og Folkesagn. 2 vols. Christiania: Cammermeyer. Germonpré, M. & R. Hämäläinen, 2007. Fossil bear bones inthe Belgian Upper Paleolithic: the possibility of a protobear-ceremonialism. Arctic Anthropology 44 (2), 1–30. Gimbutas, M., 1956. The Prehistory of Eastern Europe, part 1: Mesolithic, Neolithic and Copper Age Cultures in Russiaand the Baltic Area. (American School of PrehistoricResearch Bulletin 20. ) Cambridge (MA): PeabodyMuseum. Gjerde, J. M., 2010. Rock Art and Landscapes: Studies of StoneAge Rock Art from Northern Fennoscandia. Tromsø: Institute of Archaeology, University of Tromsø. 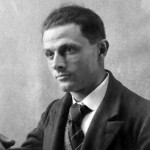 Gjessing, G., 1932. Arktiske helleristninger i Nord-Norge. Oslo: H. Aschehoug. Gjessing, G., 1936. Nordenfjelske Ristninger og Malinger av denArktiske Gruppe. Oslo: H. Aschehoug. Gjessing, G., 1942. Yngre Steinalder i Nord-Norge. Oslo: H. Aschehoug. Gjessing, G., 1945. Norges Steinalder. Oslo: Utgitt av NorskArkeologisk Selskap. Goldhahn, J., 2002. Roaring rocks: an audio-visual perspective on hunter-gatherer engravings in northernSweden and Scandinavia. Norwegian ArchaeologicalReview 35 (1), 29–61. Goldhahn, J., 2006. Hällbildsstudier i Norra Europa: Trenderoch Tradition under det Nya Millenniet. (GOTARC SerieC; Arkeologiska Skrifter 64. ) Göteborg: GöteborgsUniversitet, Institutionen för arkeologi. Grøn, O., 2005. A Siberian perspective on the north EuropeanHamburgian Culture: a study in applied hunter-gather ethnoarchaeology.Before Farming 1, 1–30. 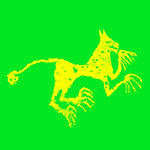 Grydeland, S. E., 2001. De Sjøsamiske Siida-samfunn: en Studiemed Utgangspunkt i Kvænangen, Nord-Troms. Sørkjosen: Nord-Troms Museum. Gurina, N. N., 1956. Oleneostrovskij mogil’nik: so vstupitel’nojstat’ej V. I. Ravdonikasa. Moscow: AN SSSR. Gurina, N. N., 1997. Istorija kul’tury drevnego naselenijaKol’skogo poluostrova. Saint Petersburg: Tsentr Peterburgskoe vostokovedenie. Gurina, N. N., 2005. 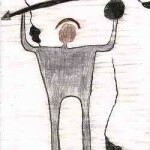 The Petroglyphs at Čalmn-Varrė on the KolaPeninsula: Analysis and Analogies, trans. A. Stalsberg. (Vitark 5; Acta Archaeologica Nidrosiensia. ) Trondheim: Tapir Academic Press. Hagen, A., 1965. 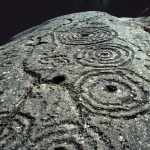 Rock Carvings in Norway. Oslo: JohanGrundt Tanum. Hagen, A., 1976.Bergkunst: Jegerfolkets Helleristninger ogMalninger i Norsk Steinalder. Oslo: Cappelen. Halinen, P., 2005. Prehistoric Hunters of Northernmost Lapland: Settlement Patterns and Subsistence Strategies. Helsinki: Finnish Antiquarian Society. Hallowell, A. I., 1926.Bear ceremonialism in the northernhemisphere. American Anthropologist 28 (1), 1–175. Hallström, G., 1938. Monumental Art of Northern Europe fromthe Stone Age. Stockholm: Thule. Hallström, G., 1960. Monumental Art of Northern Swedenfrom the Stone Age: Nämforsen and Other Localities. Stockholm: Almqvist & Wiksell. Harvey, G., 2005. Animism: Respecting the Living World. London: C.Hurst & Company. Helskog, E., 1978. Finnmarksviddas forhistorie, in Finnmarksvidda: Natur — Kultur. Oslo: Norges OffentligeUtredninger 18A, 135–44. Helskog, K., 1984. The younger Stone Age settlements inVaranger, north Norway: settlement and populationsize. Acta Borealia 1, 39–70. Helskog, K., 1987. Selective depictions: a study of 3000 yearsof rock carvings from Arctic Norway and their relationship to the Sami drum, in Archaeology as Long-termHistory, ed. I. Hodder. (New Directions in Archaeology. ) Cambridge: Cambridge University Press, 17–30. Helskog, K., 1988. Helleristningene i Alta: Spor etter Ritualerog Dagligliv i Finnmarks Forhistorie. Alta: K. Helskog; Distributed by Alta Museum. Helskog, K., 1999. The shore connection: cognitive landscapeand communication with rock carvings in northernmost Europe. Norwegian Archaeological Review 32 (2),73–94. Helskog, K., 2010.From the tyranny of the figures to theinterrelationship between myths, rock art and theirsurfaces, in Seeing and Knowing: Understanding RockArt with and without Ethnography, eds. G. Blundell, C. Chippindale & B. Smith. (Rock Art Research InstituteMonograph Series. ) Johannesburg: Wits UniversityPress, 169–87. Helskog, K., 2011. Reindeer corrals 4700–4200 bc: myth orreality? Quaternary International 238 (1–2), 25–34. Helskog, K. & E. Høgtun, 2004. Recording landscapes inrock carvings and the art of drawing, in PrehistoricPictures as Archaeological Source, eds. G. Milstreu & H. Pröhl. (GOTARC Serie C; Arkeologiska Skrifter 50. ) Göteborg: Göteborgs Universitet, Institutionen förarkeologi, 23–31. Helskog, K., B. Hood & V. Shumkin, in prep. Dwelling Formsand Settlement Patterns on Russia’s Kola PeninsulaCoast, 2200–1500 cal bc. Hesjedal, A., 1993. Finnmarks eldste helleristninger? Ottar194, 25–35. Hesjedal, A., 1994 a. Helleristninger som tegn og tekst: enanalyse av veideristningene i Nordland og Troms. Tromsø: Institutt for samfunnsvitenskap, Universitetet iTromsø. Hesjedal, A., 1994 b. 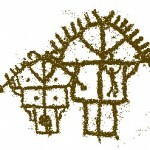 The hunters’ rock art in northernNorway: problems of chronology and interpretation. Norwegian Archaeological Review 27 (1), 1–14. Honko, L., S. Timonen, M. Branch & K. Bosley, 1993. TheGreat Bear: a Thematic Anthology of Oral Poetry in theFinno-Ugrian Languages. Oxford: Oxford UniversityPress. Hood, B. C., 1988. Sacred pictures, sacred rocks: ideologicaland social space in the north Norwegian Stone Age. Norwegian Archaeological Review 21 (2), 65–84. Hoppal, M., 1997. Helping spirits in Siberian shamanism, in Circumpolar Animism and Shamanism, vol. 3, eds. T. Yamada & T. Irimoto. Hokkaido: Hokkaido UniversityPress, 193–206. Hornborg, A.— C., 2008. Mi’kmaq Landscapes: from Animism toSacred Ecology. Aldershot: Ashgate. Hultkrantz, Å., 1991. The drum in shamanism: some reflections, in The Saami Shaman Drum, eds. T. Ahlbäck & J.Bergman. (Scripta Instituti Donneriani Aboensis 14. ) Stockholm: Almqvist & Wiksell International, 9–27. Ingold, T., 1986. The Appropriation of Nature: Essays onHuman Ecology and Social Relations. (Themes in SocialAnthropology. ) Manchester: Manchester UniversityPress. Janhunen, J., 2003. Tracing the bear myth in northeast Asia. Acta Slavica Iaponica 20, 1–24. Janik, L., 2010. The development and periodisation of WhiteSea rock carvings. Acta Archaeologica 81 (1), 83–94. Janik, L., C. Roughley & K. Szczęsna, 2007. Skiing on therocks: the experiential art of fisher-gatherer-hunters inprehistoric northern Russia. 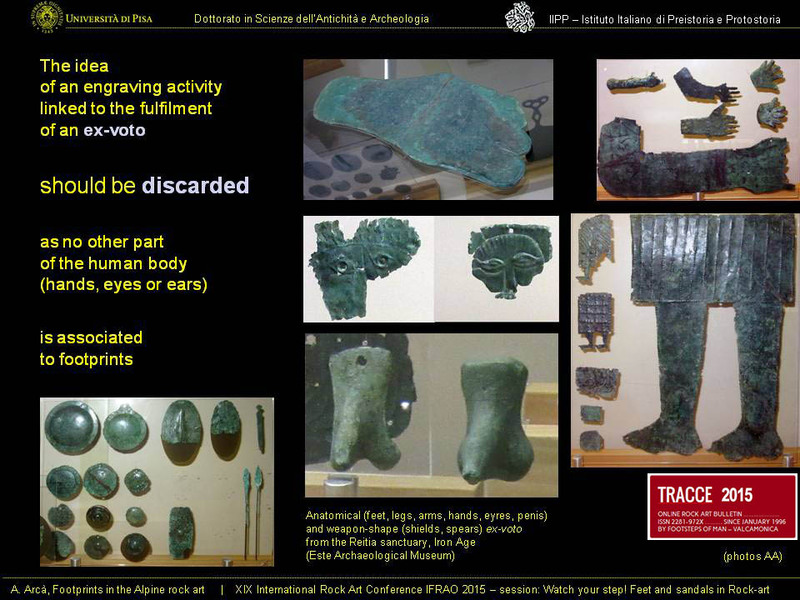 Cambridge ArchaeologicalJournal 17 (3), 297–310. Jordan, P., 2003. Material Culture and Sacred Landscape: theAnthropology of the Siberian Khanty. Walnut Creek (CA): AltaMira Press. Kailo, K., 2008.From the unbearable bond to the gift imaginary: arch-aic bear ceremonials revisited, in Wo (men) and Bears: the Gifts of Nature, Culture and GenderRevisited, ed. K. Kailo. Toronto: Inanna Publications,243–314. Karjalainen, K. F., 1927. Die Religion der Jugra-völker, vol.3. (FF Communications 63. ) Helsinki: SuomalainenTiedeakatemia. Kivikäs, P., 2009.Suomen Kalliomaalausten Merkit. Jyväskylä: Atena. Kivikoski, E., 1961. Finlands Förhistoria. Stockholm: Almqvist& Wiksell. Kivisalo, N., 2008. The Late Iron Age bear-tooth pendants inFinland: symbolic mediators between women, bears, and wilderness? Temenos 44 (2), 263–91. Kjellström, R. & H. Rydving, 1988. Den Samiska Trumman. Stockholm: Nordiska museet. Kolpakov, E. M., 2008. Petroglyphs of Kanozero: typological analysis, in Kanozero Petrogliphs: the KirovskInternational Conference on Rock Art. Kirovsk: KirovskMunicipality, 64–5. Kolpakov, E. M. & V. Y. Shumkin, 2012. Rock Carvings of Kanozero. Saint Petersburg: St Petersburg State UniversityFaculty of Philology. Kolpakov, E. M., A. I. Murashkin & V. Y. Shumkin, 2008. Therock carvings of Kanozero. Fennoscandia Archaeologica25, 86–96. Kuusi, M., 1963. Karhunpeijaiset, in Suomen kirjallisuus I. Keuruu: Otava, 41–51. Lahelma, A., 2007. ‘On the back of the blue elk’: recentethnohistorical sources and ‘ambiguous’ Stone Agerock art at Pyhänpää, central Finland. NorwegianArchaeological Review 40 (2), 113–37. Lahelma, A., 2008 a.Communicating with ‘stone persons’: anthropomorphism, Saami religion and Finnish rockart. Iskos 15, 121–42. Lahelma, A., 2008 b. 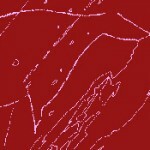 A touch of red: archaeological andethnographic approaches to interpreting Finnish rockpaintings. Iskos 15, 6–76. Lahelma, A., in press.Communicating with ‘stone persons’: anthropomorphism, Saami religion and Finnish rockart, in Cognition and Signification in Northern Landscapes, eds. E. Walderhaug & L. Forsberg.Bergen: Universityof Bergen. Leem, K., J. E. Gunnerus & E. J. Jessen, 1767. Knud LeemsBeskrivelse over Finmarkens Lapper: Deres Tungemaal, Levemaade og Forrige Afgudsdyrkelse.Copenhagen: Trykt udi det Kongel. Wæysenhuses Bogtrykkerie afG. G. Salikath. Lindqvist, C., 1994. Fångstfolkets Bilder: en Studie av deNordfennoskandiska Kustanknutna Jägarhällristningarna. Stockholm: Institute of Archaeology, University ofStockholm. Manker, E. M., 1950. Die lappische Zaubertrommel — eine ethnologische Monographie, vol. II: Die Trommel als Urkundegeistigen Lebens. Stockholm: Gebers. Mebius, H., 1968. Värro: Studier i Samernas Förkristna Offerriter. Uppsala: Almqvist & Wiksell. Mulk, I.-M. & T. Bayliss-Smith, 2006. Rock Art and Sami Sacred Geography in Badjelánnda, Laponia, Sweden: Sailing Boats, Anthropomorphs and Reindeer. Umeå: Department ofArchaeology and Sami Studies, University of Umeå. Myrstad, R., 1996. Bjørnegraver i Nord-Norge. Unpublished doctoral thesis, Institutt for samfunnsvitenskap, University of Tromsø. Nelson, R. K., 1983. Make Prayers to the Raven: a Koyukon Viewof the Northern Forest. Chicago (IL): The University ofChicago Press. Norlander-Unsgaard, S., 1985. On gesture and posture, movements and motion in the Saami bear ceremonialism, in Saami Pre-Christian Religion: Studies on the Oldest Traces of Religion among the Saamis, eds. L. Bäckman& Å.Hultkrantz. (Acta Universitatis Stockholmiensis. Stockholm Studies in Comparative Religion 25. ) Stockholm: Almqvist & Wiksell International, 189–200. Olsen, B., 1994. Bosetning og Samfunn i Finnmarks Forhistorie. Oslo: Universitetsforlaget. Paproth, H.-J., 1976. Studien über das Bärenzeremoniell, vol.1: Bärenjagdriten und Bärenfeste bei den tungusischenVölkern. Uppsala: Religionshistoriska Institutionen. Pentikäinen, J., 2007. Golden King of the Forest: the Lore of theNorthern Bear, trans. C. Tolley. Helsinki: Etnika. Poikalainen, V., 2007. Onega Petroglyphs. Kirovsk: KirovskMunicipality. Rankama, T., 2003. The colonisation of northernmost FinnishLapland and the inland areas of Finnmark, in Mesolithic on the Move: Papers Presented at the Sixth International Conference on the Mesolithic in Europe, Stockholm2000, eds. L. Larsson, H. Kindgren, K. Knutsson, D. Loeffler & A. Åkerlund. Oxford: Oxbow Books, 37–46. Ravdonikas, V. I., 1936. Naskal’nye izobrazenija Onezskogoozera i Belogo morja. Moscow: Izdatel’stvo Akademiinauk SSSR. Renouf, M. A. P., 1989. Prehistoric Hunter-fishers of Varangerfjord, Northeastern Norway: Reconstruction of Settlementand Subsistence during the Younger Stone Age. (BritishArchaeological Reports 487.) Oxford: BAR. Rheen, S., 1983 (1897). En kortt Relation om LapparnesLefwarne och Sedher, wijd-Skiepelser, Sampt i MångaStycken Grofwe Wildfarellsser, in Berattelser om Samerna i 1600-talets Sverige, ed. P. Fjellstrom. (Acta RegiæSocietatis Skytteanæ 27. ) Umeå: Samfundet. Rydving, H., 1991. The Saami drums and the religiousencounter in the 17 th and 18 th centuries, in TheSaami Shaman Drum, eds. T. Ahlbäck & J.Bergman. (Scripta Instituti Donneriani Aboensis 14.) Stockholm: Almqvist & Wiksell International, 28–51. Sandegren, F. & J. Swenson, 1997. Björnen: Viltet, Ekologinoch Människan. Uppsala: Svenska Jägareförbundet. Savatejev, Y. A. & N. Vereschagin, 1978.Hunting animals andstone implements of the population of Karelia andthe southern part of the Kola Peninsula, in MesolithicSettlements of Karelia. Petrozavodsk: Akademia Nauk,181–215. [In Russian. ]Schefferus, J., 1956 (1673). Lappland, ed. E. Manker, trans. H.
Shirokogoroff, S. M., 1935. Psychomental Complex of the Tungus. London: Kegan Paul, Trench, Trubner & Co.
Shumkin, V. Y., 1990. 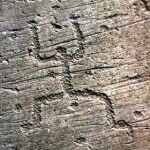 The rock art of Russian Lappland. Fennoscandia Archaeologica 7, 53–67. Siikala, A.— L. & O. Ulyashev, 2011. Hidden Rituals and PublicPerformances: Traditions and Belonging among the Post-Soviet Khanty, Komi and Udmurts. (Studia Fennica: Folkloristica. ) Helsinki: Finnish Literature Society. Simonsen, P., 1958. Arktiske Helleristninger i Nord-Norge, vol. II. Oslo: Aschehoug. Simonsen, P., 1961. Varanger-funnene, vol. II: Fund ogUdgravninger på Fjordens Sydkyst. (Tromsø MuseumsSkrifter VII, II.) Tromsø/Oslo: Universitetsforlaget. Simonsen, P., 1979. Veidemenn på Nordkalotten, vol. 3: Yngresteinalder og overgang til metall tid. (Stensilserie B, Historie 17.) Tromsø: Institutt for Samfunnsvitenskap, Universitetet i Tromsø. Simonsen, P. & K. Odner, 1963. Varanger-funnene, vol. III: Fund og Udgravninger i Pasvikdalen og ved den Østlige Fjordstrand. (Tromsø Museums Skrifter VII, III.) Tromsø/Oslo: Universitetsforlaget. Skandfer, M., S. E. Grydeland, S. Henriksen, R. A. Nilsen& C. R. Valen, 2010. Tønsnes Havn, Tromsø Kommune, Troms: Rapport fra arkeologiske Utgravninger i 2008 og2009. Tromsö: Universitetet i Tromsø. Sognnes, K., 1981. Helleristningsundersøkelser i Trøndelag 1979 og 1980. Trondheim: Universitetet i Trondheim. Storå, N., 1971. Burial Customs of the Skolt Lapps, trans. C. Grapes. Helsinki: Academia Scientarum Fennica. Tansem, K., 1999.Fra Komsakultur til Eldre Steinalder i Finnmark. (Stensilserie 54.) Tromsø: Institutt for arkeologi, Universitetet i Tromsø. Tolley, C., 2006. The bear in Germanic legend, in KarhunKannoilla: In the Footsteps of the Bear, ed. C. Tolley. Pori: School of Cultural Production and Landscape studies, University of Turku. Tolley, C., 2009. Shamanism in Norse Myth and Magic, vol. 1. Helsinki: Academia Scientarum Fennica. Ukkonen, P., 2004. Early in the North: Utilization of AnimalResources in Northern Finland during Prehistory. (Iskos 13.) Helsinki: The Finnish Antiquarian Society. Vasil’ev, B. A., 1948. Medvezhii prazdnik. Sovetskaia Etnografiia 4, 78–104. Vitebsky, P., 1995. The Shaman. Boston (MA): Little, Brown. Welinder, S., 2009. Sveriges Historia: 13000 f. Kr.— 600 e. Kr. Stockholm: Norsteds. 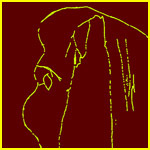 Wylie, A., 2002. Thinking from Things. Essays in the Philosophy ofArchaeology.Berkeley (CA): University of California Press. Yamada, T., 1997. An anthropology of animism and shamanism, in Circumpolar Animism and Shamanism, eds. T. Yamada & T. Iromoto. Hokkaido: Hokkaido UniversityPress, 315–27. Zachrisson, I., 1981. En björngrav från Jämtland. Jämten 74,80–88. Zachrisson, I., 1991. The Saami shaman drums: some reflextions from an archaeological perspective, in TheSaami Shaman Drum, eds. T. Ahlbäck & J.Bergman. (Scripta Instituti Donneriani Aboensis 14.) Stockholm: Almqvist & Wiksell International, 80–95. Zachrisson, I. & E. Iregren, 1974. Lappish Bear Graves in Northern Sweden: an Archaeological and OsteologicalStudy. Stockholm: Kungl. Vitterhets historie och antikvitetsakademien. Zolotarev, A. M., 1939. The bear festival of the Olcha. American Anthropologist 39 (1), 113–30. Zvelebil, M., 2008. Innovating hunter-gatherers: the Mesolithic in the Baltic, in Mesolithic Europe, eds. G. Bailey& P. Spikins. Cambridge: Cambridge University Press,18–59. That’s it for today. Hope I have been of some help to you. Mx name is Hans Oswald from regensburg/Bavaria. 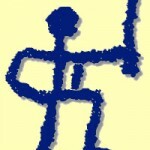 If you go to etsy.com and look there for my shop MysticArtworks you find what I do for a hobby: Petroglyphs and stuff. You write about brars, I engrave and paint them! hahaha – it’s a small world.